In Home Viewings: "The Hunter"
EDITOR'S NOTE: This is the sort of film that is nearly impossible to review properly without spoiling some elements of the plot. Seeing as how I think it's a total misfire, I was tempted to just let the entire cat out of the bag rather than just showing you its mangy tail but decided against it at the last minute. Sorry if this is the worst review ever. When a Tasmanian tiger, thought to be extinct for many years, is spotted in the Tasmanian wilderness, a mysterious pharmaceutical company calls upon the services of mercenary Martin David (Willem Dafoe). Under the guise of a university scientist, Martin is tasked with tracking down and killing the tiger in order to obtain its valuable DNA. Upon arrival, he rents a room from Lucy Armstrong (Frances O’Connor), whose husband supposedly saw the tiger but has been missing for several weeks. While Martin’s initial forays into the wilderness prove fruitless, he becomes more and more invested in the lives of Lucy and her two small children, finding a connection he hasn’t felt in his many years of solitude. But with such a high value target, Martin soon discovers that he is not alone in the hunt and his connection with the Armstrongs puts them all in grave danger. Based on the novel by Julia Leigh, The Hunter is one of the more unnecessarily confusing films you’re ever likely to come across. The core concept is very interesting but from that point on the narrative is a convoluted mess that never comes close to measuring up to the premise. There are a number of questions posed in the early going, intriguing questions, but from that point on The Hunter seems more interested in misleading the viewer than it does answering those questions or even really bringing them to the light. I kept waiting for something to break, for a twist that would justify the strange way in which Martin becomes more and more invested in the lives of the Armstrong family. But even as the film shifts its main focus, to give the viewer a reason to care or even a reason to understand. I questioned the motives of every single character within this film until I reached a point at which I simply stopped caring. Because of this, the emotional gong The Hunter attempts to bang in the third act fell completely flat and left me wondering what the point of all this had been in the first place. For his part, Dafoe is very good in his role. I would gladly watch a film about Martin, his mission, and the scars a man like him carries. Dafoe is one of the few actors who thrives on quietness and when The Hunter allows him to operate within the quiet, he delivers nicely. But these moments are few and far between, overshadowed by a plethora of confusing developments that seem half baked at best. I must be honest, I still have no idea how Sam Neill’s character was connected to the other characters or what exactly his role in the events of the film were. This is one of the more minor flaws as to focus on the more egregious errors would be to spoil things for anyone who still plans to see this film. 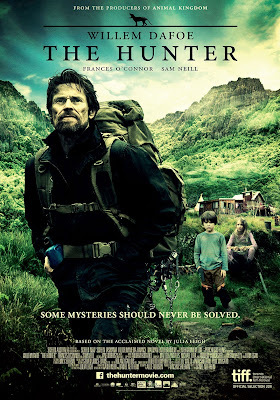 The Hunter isn’t the worst film I’ve ever seen and it didn’t make me hate my life but it struggles mightily with its own plot and eventually winds up becoming an unsatisfying waste of an opportunity.